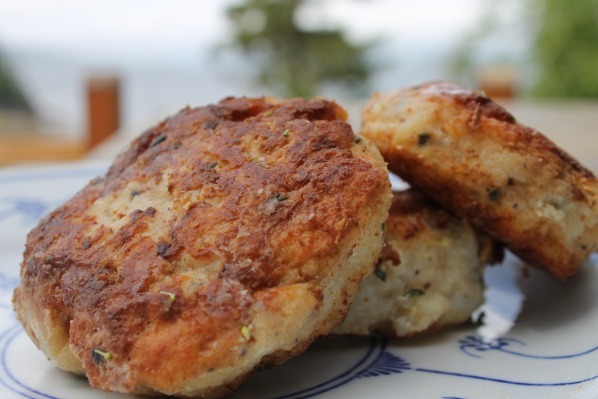 Delight your friends and family with these delicious fish cakes made from fresh cod! They are easy to make, healthy and tastes heavenly. Remove skin and bones from the fish. Cut the fish into medium size pieces. Add the sea salt and let it rest in the refrigerator for 30 minutes. Squeeze out the remaining water. Add the egg, herbal salt, garlic, pepper, chives and nutmeg. Add flour and milk and mix well by hand. Taste to your own perfection. Put the mixture cool for an hour. Form medium size fish cakes with your hands. Fry in a medium hot pan for about 7 minutes on each side until the cakes are golden brown. Serve with Norwegian almond potatoes and carrot stew or in a hamburger bun with lettuce, tomato and fresh dressing.